Lentil Miso Soup. | Eat More Plants. I love, love, love lentil soup. I also love, love, love miso soup. So I decided to combine the two. Very easy and great for those weeks when you don’t have time to cook every night. I love making a giant pot of soup and reheating a little bit as I’m hungry. Miso is one of my favorite ways to season foods. If you’ve never bought it before, don’t be intimidated. Start with a lighter miso, like yellow or chickpea and see how you like it. The longer it has been aged, the stronger the flavor. note: carrots, celery and onion should all be relatively the same size so they cook evenly. Never add miso to boiling soup! You will cook out all the important cancer fighting properties. I always add miso to my soup after I have served it. It will melt into your soup from the heat of the broth. Heat the oil in a large heavy bottomed pot over medium heat. Add in the carrots, celery, onion or leek and garlic. Stir occasionally for 5-6 minutes and then reduce heat to low and cook for another 5-6 minutes. Add in all the remaining ingredients, except for the add ins. Stir and raise heat to medium. Bring just to a gentle boil, reduce heat to low and simmer for 30-40 minutes, or until the lentils are tender to your liking. Taste and adjust salt if necessary, but remember that the miso you will add later is salty so don’t over season it. When serving, place 1 teaspoon of miso and 1 cup of baby greens in the bottom of each bowl and spoon the soup over it. I like to eat my lentil soup plain or with pasta; you can try it with cooked rice or even barley. note • you can add more veggie stock if your soup is too thick! Alternatively, you can blend it a bit with an immersion blender (or carefully in a regular blender) if it’s too thin. 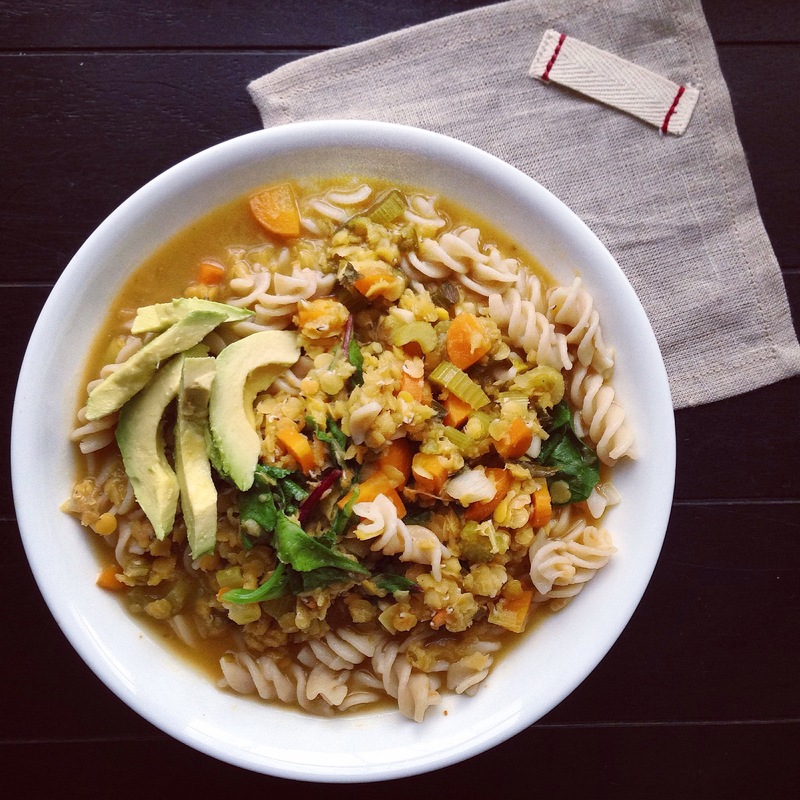 I love lentil soup and miso, but I never thought of putting the two together. Thank you for the recipe! Sprout your lentils first for a nutritional boost, if you think of it ahead! What a wonderful idea to add the miso! Oh good idea!! Will do that next time 🙂 thanks!